Guest author, Tim Marshall, Emeritus Professor of Planning at Oxford Brookes University, explains why he is not in favour of the Stonehenge proposal and puts the A303 Expressway in the context of national transport planning policy. Professor Marshall is a planning academic, formerly a planning practitioner with a lifetime interest in archaeology. He writes independently of The Stonehenge Alliance. The following article is based on Professor Marshall’s response to Highways England’s A303 Stonehenge consultation last March. I have read all documentation produced by the Department for Transport and consultants and fail to see that any rational case has been made. I oppose the whole project to make an Expressway. We need to move urgently to a more considered approach to transport planning, a transport system based on long term sustainability, not locking us even deeper into the fossil fuel era. There is now a general policy to push Expressways across England with remarkable similarity to schemes discussed in the 1970s. There is little or no research evidence for the rhetorical claims in DfT and Highways England documents that massive road investments such as this will make a difference to economic productivity or support claims for transport, community or environmental gains. 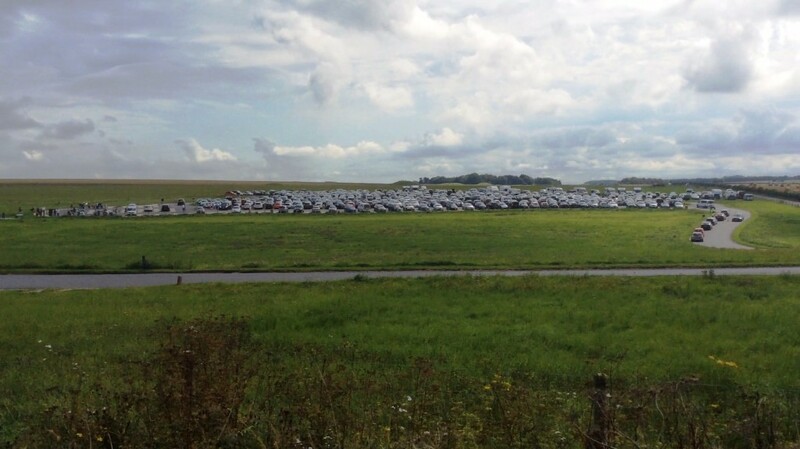 The improvement to “cultural heritage” claim is particularly doubtful and disturbing, given the failure to consider the landscape impacts across the whole Stonehenge area in the long term. The arguments against the cost effectiveness of the present approach have been rehearsed many times since the early 1990s and retain all their validity unlike the 2013-2014 DfT studies on which the present proposals are based. These were very clearly too limited in their brief and scope, with almost a built-in order to come up with road expansion schemes. The absence of consideration of real long term sustainable alternatives invalidates the post 2013 studies. A much more open study is needed for the whole south west region, with a particular focus on the sub-region of the World Heritage Site, linking the largest population centres in south east England to the south west. 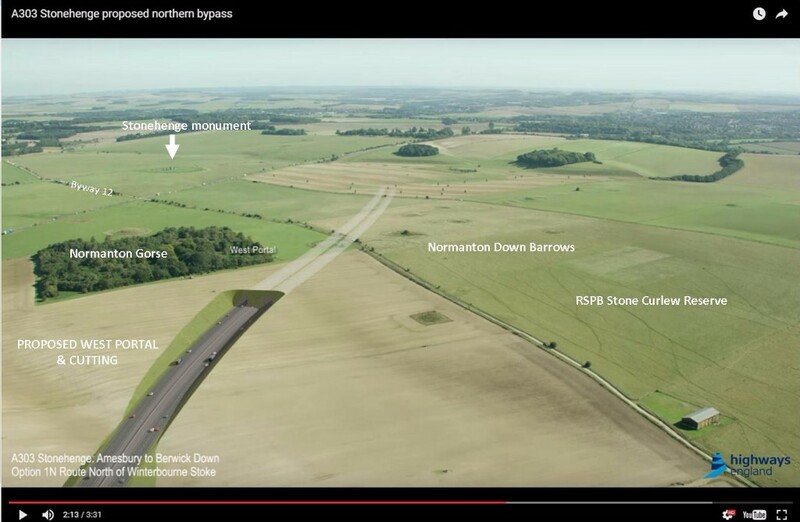 “In a landscape which has endured through the centuries with minimal extra aggression, there is no case for spending recklessly on such heavy handed interventions in the twenty first century.” Image: Still from consultation video, Highways England. Spending between 1 and 2 billion pounds on the A303 scheme (likely to have a half life of perhaps 20 years) may be one of the least economical (in the real sense) uses of societal resources I have seen in a lifetime of involvement and teaching in relation to the built environment. Such road expansion whether with tunnels, dual carriageways, “Expressways” or “smart motorways” will look as foolish and failed as many previous policy disasters. In a landscape which has endured through the centuries with minimal extra aggression, there is no case for spending recklessly on such heavy handed interventions in the twenty first century. “The knowledge that a heavily trafficked road is running underground […] will affect the appreciation of the monument and overall experience…” Image: Inside Hindhead tunnel, Stonehenge Alliance. The massive tunnel portals, wherever they are placed, will affect the whole district to a dramatic extent. For many visitors the knowledge that a heavily trafficked road is running underground through the Stonehenge district will affect the appreciation of the monument and overall experience as much as the present road. The damage to archaeological remains and ecological systems is often as great as, if not greater than, the alternatives. Tunnelling should in my view be used much more selectively than is now being considered. The whole Stonehenge and Avebury area is one that needs the most careful treatment, seen within a temporal frame of not decades, but centuries (if not millennia). Almost yearly now archaeological finds and associated historical re-assessments are showing up the limits of the present boundaries. Over coming decades it is likely that more and more people will want to visit these areas. Sustainable modes of transport need to be designed to allow these visitors to appreciate the whole area. What should be done instead? Over a million visitors are apparently being very effectively catered for now. Visitors are struck by the very high level of experience which is affected little by the presence of the A303. When we compare the cost of the 2013 visitor centre package (£27 million) with this road scheme, the difference is so large as to be absurd. Just a miniscule portion of the money saved by not making any major road changes would finance a state of the art set of public transport schemes to make the Stonehenge and Avebury zones non-car access friendly – largely by supporting buses, and train services where practical. Over a period of 10 to 15 years these efforts could create a showpiece for a more sustainable approach to World Heritage Site management. It will take resources and time to make this shift. In the meantime, the A303 can continue to function with its current levels of traffic, until an effective public policy starts to remove the pressure from this artery. The present proposal is essentially a panic measure which future generations will look back on with horror. If built, it would be an eloquent emblem of the failed British transport policy – a star exhibit for the prosecution. We need to understand the effects on succeeding generations and wider ecosystems. I hope that there is still time for a full independent review to give a credible regional answer to the challenges of transport policy in this area.